Interstellar sleuthing scifi - inspired! This massive sourcebook clocks in at 304 massive pages, 1 page cover (though the front cover of the print edition is its separate pdf), 1 page editorial, 3 pages of ToC, 1 page blank, leaving us with no less than 298 pages of raw content – so let’s fire up the engines, shall we? Yes, we shall! This was moved forward in my review-queue due to me receiving a print copy in exchange for a fair and unbiased review. First of all, what *is* Ashen Stars? The unimaginative and not really helpful reply would be that it represents a variant of the brilliant GUMSHOE-rules-system for a Scifi-context. Since I already have covered plentiful GUMSHOE-systems in my reviews (Be sure to take a look at Esoterrorists, Fear Itself, Trail of Cthulhu and Night’s Black Agents), I will assume a basic familiarity with how the system works, the tenets of its design (failing forward etc.) and similar basic assumption. Genre-wise, you could glean as much from the description or a single glimpse at the cover, so *what* kind of scifi? There are, after all, plenty of iterations and sub-genres: From Grim Dark Warhammer 40 K over gritty Firefly to Gene Roddenberry’s utopian societies and light-hearted space-operas, there are a lot of nuances in this genre. While Ashen Stars’ system generally supports all of these genres, it should be noted that Ashen Stars describes itself rather well in tone – basically, this is the 25th century and mankind has joined an alliance of species in a vast, star-spanning empire called “The Combine.” Problem is, said empire has been ravaged by a war with the mysterious mohilar (Why mysterious? I’ll get back to that in a bit…) and now, the fringe-regions, here exemplified as the so-called Bleed, require the policing via private contractors, the so-called Lasers – it is said work that remains the focus of the campaign and while you could reskin it appropriately, I consider the basic tone pretty much perfect. The tone the book tries to evoke is basically one of a slightly grittier reboot of an utopian scifi-series – and it succeeds in that endeavor perfectly – think of it, basically, as in line with Firefly – a long shot away from grimdark despair and cataclysms, but neither is it all clean and smooth and problem-less…at least per the base system. Now I already mentioned the Combine, so what about the races featured herein? Do they work? Races in scifi need to appeal to our own sensibilities to some extent and often work best when externalized a deep-seated anxiety while blending the familiar with the exotic. Taking this as a premise, the first race depicted herein would certainly qualify: The Balla are basically space-elves – beautiful, graceful…but also controlled. Unlike Vulcans, they are defined by an underlying, exceedingly strong capacity for emotion, which requires precise control – when losing control, the results can be nasty. They also are not that compatible with cybernatics and viroware and balla actually become more beautiful with every year – to the point, where long-lived individuals have to enter seclusion to avoid driving even their own kind mad by their very presence- beauty as a curse. The Cybes would be just what you’d expect – cybernetic beings that seek distinction from their erstwhile species, either following a course of new race versus keeping ties with the original species. The somewhat hunched durugh are the latest allies of the Combine – after generations of hostilities with the Mohilar, it was, or so it is assumed, the durugh’s doing that turned the tide against the foes of the Combine…oh, and they can dimensionally phase, making them superb infiltrators. Easily the weirdest of the races in appearance, the Kch-Thk are the four-armed locust-people. Yes, you hear right. Interplanetary conquerors, these creatures had a tough time adjusting to Combine ethics and values, mainly due to a blending of Klingon-esque warrior-culture with an emphasis on consumption (for this is a constant need of the race, tying in with the locust-theme). While at this point, the Kch-Thk have been modified to not want to consume other people, the hunger prevails – and there is another unique factor: They are basically quasi-immortal. If a Kch-Thk dies in battle, its “soul” if you will, travels back and roots in a larva to be reborn and grown – though even this process will fail eventually. The armadillo-like Tavak provided the philosophical backbone for the forming of the combine and walk a balance between tranquility and a body uniquely suitable to make them powerful warriors indeed. Finally, there would be the Vas Mal, and they are few and tie in very strongly with the history of the Combine. For once, they were infinite, the Vas Kra, beings of pure energy, evolved beyond the measly constraints of physicality, with thoughts echoing through space and time, modeling reality and pervading everything – neither good, nor evil, happiness or gloom – the species just was. But, alas, from time to time, they manifested and acted – the Vas Kra intervened as quasi-deities. They exiled a renegade of their kind to a strange dimension. However, this proved your undoing – for the mohilar realized that by caring, by intervening, the Vas Kra had tied themselves to the specific – and thus, they were devolved and became the Vas Mal, mortal once again – and 5 years have passed. Physical existence may be tedious…but at least the species has kept some fraction of its erstwhile power in the guise of several unique, psychic skills…all of which impose a strain on the Vas Mal body, though. The thing you’re probably asking yourself by now would be this: How could the mohilar do this? Who are they? And this is perhaps the best dramaturgical decision in the hole book: No one knows. How were they defeated? No one knows. The biggest threat the Combine has ever faced is GONE…and nobody has even the slightest clue how it happened. Researching the event has all kinds of utterly weird repercussions that can be described as rather disturbing – and it creates a thoroughly unique core mystery at the very heart of the setting. Did the durugh really betray the Mohilar? How were they tied with the devolution of Vas Kra to Vas Mal? The phenomenon, called the Bogey Conundrum, is obscure and yet current, tied with everything and still completely opaque…and brilliant. For it allows every GM (GM) to choose the respective truth, to weave the respective stories. Also accompanying the mohilar war, the eponymous Ashen Star effect REQUIRES mention, for it represents the second absolutely brilliant narrative stratagem: Strange, dark sunspots erratically show up, in a pattern reminiscing visual static. This strange effect is what makes the job of the GM infinitely easier: Know how there usually are consistency errors in most long-running scifi-series? Well, the ashen star effect exists basically as the ultimate justification for this, as an easy to use narrative plot-device: Need communications or scanning break-down? No problem. Want to limit or expand travel speeds/durations? Ashen Star effect. Do you have a particularly epic adventure planned, one where the crew and their ship needs a power-boost? That can, just as well, be the result of the Ashen Star effect – beyond being visually stunning and disturbing, this explains basically any deviations from established lore between your campaign and published material, allows you to de-emphasize and emphasize certain components from adventure to adventure…or even modify whole storylines – much like the bogey conundrum, it represents a crucial, brilliant narrative device that irons out central issues any long-running campaign can encounter. While you still shouldn’t be too sloppy regarding technological inconsistencies between adventures, this provides a way out that means you don’t have to meticulously keep tabs on what can be gleaned and what can’t. The biggest triumph of Ashen Stars from a design-perspective also co-exists with the one aspect of the system that doesn’t manage to reach its loftiest levels of quality…but let me elaborate: First of all, Lasers, are expected to have a hierarchy that resembles to some extent that established by the Combine, the in-game justification being that it’s considered to be more professional. Thus, the system does reward adhering to this convention in a minor way, though it sure is not required. Still, clear-cut tasks, from operations officer to systems officer, both groundside and on board, mean that the respective characters have their tasks cut out for them. So that would be smart decision one – it rewards mimicking series à la Firefly et al. Secondly, there would be the ship to ship combat. The combat achieves one crucial goal – it engages the whole group of players: First, you determine a goal- depending on your goal, there is a different array of points you need to achieve: Escaping is easier than crippling a foe for towing, for example. Combat begins with ships determining initiative and then determining attack mode: Attack, maneuver, Override, Trickbag, with each of them being associated with another crew-role. When deploying an attack mode before having cycled through all available options, you’re “egging” it and take penalties, as the enemy gets a significant bonus – while this does sound odd, ultimately, it makes the crew consider cycling through PC-chances to shine a valid, desirable option, even if their ship is not balanced between the respective capabilities. Every ship has an output spec – these are a variable pool that replenishes after the fight, which can be used to enhance an attack mode. Ships have a set of paired stats – for each of the attack mode, there is a number for dishing it and for taking it – the relation between dishing and taking for the winning and losing ship, respectively, determine the number of points added to the skirmish point total. Showdown results are compared and rules for rocking the ship, mop-up operations etc. are provided…and yes, actions have consequences: Most laser-crews have someone in charge of public relations for a reason…destroying crippled ships can result in nasty blows to one’s reputation. Now the plus-side of the system is definitely that it manages to engage the whole group and provides chances to shine for each character. At the same time, in spite of some significant GUMSHOE-experience under my belt, I still had to reread the section iin which the ship-combat rules are depicted. The explanation of the rules itself is not that well structured and makes the per se nice system feel a bit more opaque than it should be. That being said, once you’ve understood it, it’s not that hard to grasp and you’ll wonder, much like I did, why the presentation, in spite of quick-reference and example, feels so complex when it actually isn’t. A second complaint one could field against the system would be the need to establish a predetermined objective for the combat – the need to do so adds a kind of abstraction to the whole proceedings that takes a bit away from the experience of the narrative space combat. While a good GM can gloss over this aspect, it’s the one thing that imho would have benefited from less abstraction and a more direct, immediate approach. That being said, this form of space combat still excels at what it does rather well. Now it should be noted that the book sports a significant array of sample ships and provides guidance on making your own ships as well as advice on e.g. depicting combats that are not based on 1:1-duels. Un a character-level, viroware (basically, biological modification) and cybertechnics feature, as expected, and similarly, weaponry and ship-combat based options are ample and detailed. Indeed, one of the components I loved most about this book is that it’s serious: It may not be humorless or dry, but it doesn’t constantly wink at you; neither does it constantly beat you over the head with pop-culture references. Much like the most compelling of examples of scifi literature, it takes its own setting VERY serious – and this makes it compelling. Believe me, a crew that features a reincarnating locust-man and a balla write their quips, puns etc. at the table for themselves – in spite of what one would expect, Ashen Stars, while serious, is, again, much like Firefly, not dry and can be rather funny. Exceedingly detailed advice for the GM on how to structure modules and campaigns complements this book…but much like most GUMSHOE-titles, to truly notice how different Ashen Stars plays ultimately requires actual play experience: And the book does contain a sample scenario, called “The Witness of my Worth.” Now I’m not going to SPOIL this introductory scenario beyond the base set-up: 3 days ago, the ashen star effect manifested over the world Ares-3. Once a mining colony, it also was the place of one of the first engagements in the mohilar war. An EvBase (environmental base, made to determine whether the planet can be re-settled) has issued a distress call – and it’s up to the Laser-crew to investigate said call – alas, the truth of what is going on directly related to the past of the planet and the odd effects of the ashen stars…but this is how far I’ll go regarding the actual plot of this adventure. Now the thing you’ll notice when playing this is the fluidity of transition between operations aboard their ship and on groundside – it requires a blending between both to solve this scenario and it presents the fluid transition between these game-play modes in surprising ease, leading by example – if anything, the module left me with a distinct curiosity what the authors can do with these transitions. This massive book also features numerous appendices for nomenclature, a fully-depicted space-combat example, character sheets, ship tracker sheets, ship combat tracker sheets, episode worksheets for the GM. Ship-bolt-on reference sheets, tech reference sheets, invetigative ability check-lists and an exceedingly detailed index help making the playing experience of Ashen Stars rather comfortable. Editing and formatting are very good, though there are slightly more glitches herein than in other GUMSHOE-books I’ve read. Layout adheres to a beautiful two-column full-color standard and the book sports numerous pieces of nice artwork. The pdf-version comes with extensive, nested bookmarks for your convenience. Additionally, the book features .mobi and .epub-versions of the file and there is a second, more printer-friendly pdf included in the deal – kudos! My version also included “A Pirate’s Life”, a nice 14-page short story. The pdf is layered for your convenience, btw. If you have the option, by the way, then I’d STRONGLY suggest getting this in print – the full-color hardcover, stitch-bound and solid in the finest sense of the word, is a true beauty, with nice, high-quality paper making the book a joy to hold and just flip through. 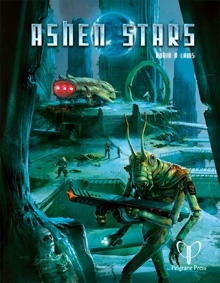 Robin D. Laws’ Ashen Stars is a fantastic book. There are no two ways around it – granted, I can name systems with more direct ship-to-ship-combat; I can name systems with slightly more pronounced character customization-options – but that would be missing the point. Ashen Stars excels in that it manages to actually portray in roleplaying games the feeling of series like Star Trek, Andromeda or Firefly, in that it manages to work equally well both on a crew level and on a personal level. That, and the emphasis on investigation, mystery and exploration are what makes this scifi-rules-set great, though I really wished the ship-to-ship combat was a bit more direct and explained a bit better. But that’s not what you’ll take out of reading Ashen Stars. This rpg-book made me feel like I had just entered Mass Effect’s Citadel for the first time, like I had just started checking out Hyperion or Ubik – this roleplaying game manages to evoke an internal consistency I absolutely adore. Its mysteries are genius and compelling and it actually is a great read – this book captivated me more than quite a few scifi-books I’ve read. It also manages to have the potential to serve all kinds of subgenres, without being tied to them and manages to depict advanced technology that remains believable, while not hamstringing itself with over-explaining matters (and inevitably stumbling). In one short sentence: This setting managed to captivate me, makes me want to know (and play) more. As a reviewer, the didactically somewhat unfortunate depiction of the ship combat rules constitutes a flaw I have to acknowledge in my final verdict. However, at the same time, the setting is quite frankly the most compelling scifi setting I’ve read in AGES, with the brilliant narrative strategems employed rendering it so much easier to run this than similar systems while maintaining internal consistency. In the end, I want to see more and, even as just reading material, still have to whole-heartedly recommend this gorgeous book. My final verdict will hence clock in at 4.5 stars, rounded up to 5 for the purpose of this platform…and for the superb world-weaving, this also receives my seal of approval. You can get this wonderful, massive scifi campaign setting here on OBS!